Despite the decline of the classical Cremonese school during the 18th century, violin making in northern Italy continued to be highly personalized. The work of the greatest Italian makers of the late 18th and early 19th centuries, such as G.B. Guadaganini, G.B. Ceruti and Lorenzo Storioni, reveals a fierce individualism while remaining within the classical traditions. Meanwhile the French, led by Nicolas Lupot, were creating highly disciplined and precise interpretations of Stradivari’s work. When Giovanni Pressenda arrived in Turin around 1817, he rapidly established his importance as a maker who sat between the two schools. He approached violin making with a Lupot-like discipline and precision, but, like Guadagnini, his violins are distinguished by a distinctly individual flair and a fluency of understanding that reveals his exposure to classical violins. Pressenda came to violin making late in life. Although his labels refer to his father Raphael, “Joannes Franciscus Pressenda q.Raphael / fecit Taurini”, his family were in fact peasants and the strong French influence in his work, together with the absence of Pressenda instruments before his arrival in Turin, suggests that he was trained in one of the French-run Turin workshops. He was 43 when he moved to Turin and his work already displays a mature and confident hand, producing highly sophisticated and accurate interpretations of the Stradivari model. Towards the last part of his working life in the period from 1830 to his death in 1854, Pressenda’s violins are made on a very personalized model which displays an understanding of Stradivari and Guarneri ‘del Gesù’. The violin shown here was made in 1828 and is a fine example from the period when Pressenda was more explorative in his choice of models. It is tempting to speculate about the influence of Luigi Tarisio during this period and the classical examples in his collection. Like Giuseppe Rocca, certain Pressenda instruments come very close to specific violins in Tarisio’s possession. 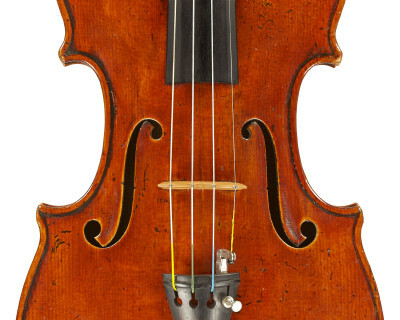 This example resembles many late-period Stradivari violins such as the c.1734 ‘Habeneck’ and the 1736 ‘Swan’, both of which were owned by Tarisio. The bold arching, rising steeply from the purfling, is highly reminiscent, as are the soundholes, which show many of the characteristics that show the hand of Francesco Stradivari as evident in the original late-period Stradivaris. Pressenda left a statement of individuality in his scroll, which has much of the grandeur of Stradivari but is finished with a distinctive oversized eye.